I was recently given the golden gift of a bunch of kale. Golden because it is unbelievably difficult to find in San Sebastian. I now have two other sources for kale – a fact I was unaware of as I savored each leaf and deliberated over what to make. The conversation in my Spanish class the day I received my gift revolved around what one could do with kale: the look on my Turkish colleague’s face when I showed her this carbonara made my decision easy on what to finally post. Yes, my first cooking post since moving to Spain 5 months ago. Oops. I am on a budget here and share a kitchen with 5 other individuals. That makes for SOME very simple and inexpensive cooking. One of my go-to favorites here is a basic carbonara. There are a variety of ways to make this pasta but the key is the raw egg mixed into the hot pasta. The farm eggs here are amazing and plentiful. While the ham here is the best, I made this vegetarian version to take advantage of the kale. I promise this is simple and delicious. Double or triple recipe to make enough for everyone. Cook your favorite pasta in plenty of salted water. While pasta is cooking, prepare your garlic, kale and eggs. Strain pasta and RESERVE about 1/2 cup of the pasta water. In the same pot, add 2 tablespoons of the olive oil and put over low flame. Add the garlic immediately and stir to keep it from getting brown (the pot is still hot and will cook quicker than you may realize). Add chili flakes if using. After a minute or so of stirring the garlic, add the kale. Sauté for just a minute until it appears soft. Add the pasta back into the pot and stir to keep from sticking to the bottom. Add the other tablespoon of oil if needed. Add 1-2 tablespoons of the reserved water. Turn the heat off. While mixing with a fork, add the eggs and stir constantly until you have a rich creamy sauce. Add more of the reserved water if you want it creamier. Add salt and plenty of fresh pepper to taste (and the zest if you are using it). Add parmesan to each individual bowl of pasta. I’ve been in Spain now just about 5 or 6 weeks and so far so good though. Looking up gluten free in Spain yielded a few results but I knew from earlier experiences that Spain can be pretty easy when it comes to eating gluten free, naturally. Breakfast is tough, snacks are tough. But what else is new? There have been many changes since last I was in the country. When I ask, “is there flour in that?” most waiters immediately know to say “no, no hay gluten”. Yep, everyone seems to know what gluten is. Great, for the most part. While hiking the Camino de Santiago, I quickly learned I needed my own snacks. Every guide and every individual will say not to pack your own food on the camino, if you have Celiacs, don’t listen. Luckily, plenty of places in the cities and often even in the towns, have a few options. Every few days I bought a bag of cookies. The pharmacies, para-pharmacies, and the “natural” and “herbal” stores always have options. The problem is that you don’t want to walk with much and you don’t know when you’ll have access to a toaster or utensils- so cookies and crackers are usually the way to go. I quickly learned which cookies or crackers were my favorite and least sweet (coming soon) and because I need to eat something in the morning, I’d eat a few before hitting the road. And these aren’t gourmet and delicious, they are regular old gf processed cookies from a bag, so while tasty, not exactly good for me. Once on the road, I’d keep my eyes peeled for a tortilla (usually de patate). Almost every small town we walked through had a coffee shop with a tortilla and a cup of coffee with my name on it. I’d walk for anywhere between 1-3 hours and then stop for breakfast. Once breakfast was out of the way, the rest was easy (usually). For anyone reading this as a guide, make sure you request “sin pan” when you FIRST order your tortilla. If you don’t, they will bring you the tortilla on bread or on the same plate. This system worked out fine for me since I liked the morning alone and while most folks were eating sandwiches or pastries in the morning, I was already walking and then taking a leisurely breakfast break. Walking the camino involved a lot of towns with “menus del dia” or menu of the day for a set price. It was usually a 3 course meal with a bottle of wine included for incredibly cheap. There was pretty much always an option for the gluten intolerant and usually a server who had an idea of what that means. Several places even had an *ask about our gluten free menu. The first small town I went through with a sign saying “gluten free pasta” made me so happy that I got a bowl even though I was barely hungry. After that, I quickly realized that many places along the camino cater to just such ailments. And no extra charge, by the way, for ordering the gluten free version. I will say that having cookies or crackers in my bag at all times saved me on a number of occasions. When you’re walking and walking and suddenly incredibly hungry but everything is closed for siesta and the easiest thing to do is buy a baguette or a pastry along the way, it’s a pretty good idea to have an emergency stash in your bag. Just never too much at once- every ounce on your back counts! I ran into a friend of mine at the grocery store and the conversation steered towards pistachios and how difficult they can be to find raw, shelled, and organic. I bake with a lot of different nut flours but for some reason pistachios are not often in my rotation- perhaps that’s why. The next time I saw them at the store, I bought a pound or two and made this torte, ice cream, and added them to a variety of breads and chocolates as well. This recipe is based on a Sicilian dessert I saw in Southern Italian Desserts on my mother’s desk a long while back. I’d been wanting to make it for some time and the pistachio conversation brought it all back. While this torte can stand on its own, it also reminded me of the bottle of Limoncello my parents had brought back for me from Italy. 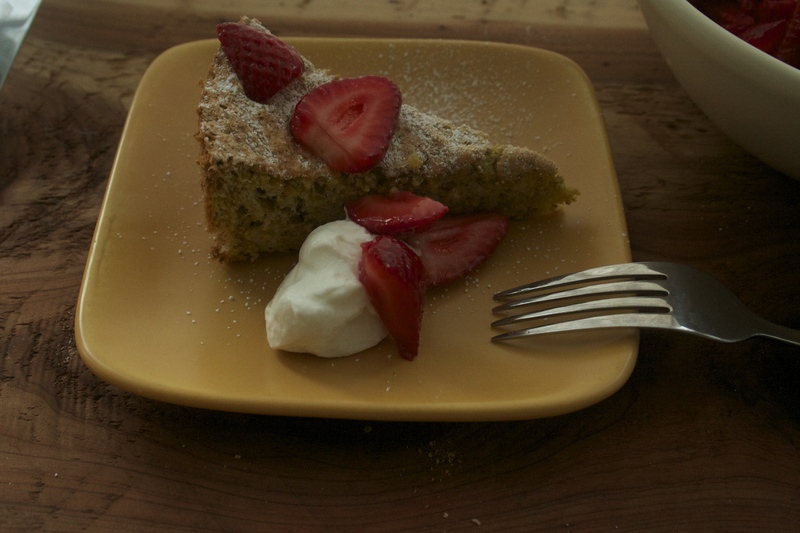 I’d been saving it for a rainy day and what better occasion than the creation of a perfect pistachio torte? Preheat the oven to 325 and position a rack in the lower third of the oven. Grease a 9-inch springform pan and line the bottom with parchment paper. Blend the pistachios and salt in a food processor until almost fine. A few larger pieces are okay. Pulse in the zest. In a large bowl using a handheld mixer (or standup if you have one) beat the egg whites until they hold soft peaks. Add 75 grams of the sugar and beat until stiff. In a second smaller bowl, beat the egg yolks and 50 grams of sugar until yolks turn slightly pale. Fold the yolk mixture into the whites. When blended, fold the pistachios in as well, a third at a time. Pour mixture into the springform pan and bake for 30-35 minutes. A toothpick should come out with some crumb but not wet. Let cool completely before cutting. Sprinkle powdered sugar over if desired. Combine the ingredients in a bowl, stir, cover, and let sit for at least an hour. Spoon the juices over the strawberries at least once and again before serving. While in Los Angeles with family this spring my sister brought over leftovers from a catering gig. She had deliciously chopped and stewed greens to put with aioli on baguette slices. I couldn’t stop dipping my crackers into the aioli and topping it with the greens. While I normally steer clear of chard there was a tiny kick to her dish and with the smooth garlicky aioli it just worked so well. After my return to Austin, I was given a bunch of Swiss Chard and Beet Greens. Instead of immediately giving them to someone else or to my compost, I decided I’d see if I could create something I would like too. I brought back several bags of my favorite pasta, La Fabbrica della Pasta Senza Glutine from the Italian Import Store, Guidi Marcello. This pasta is far and away one of my top three pasta options (even if I have to leave room in my suitcase just for a trip to Guidi Marcello). Because this doesn’t have a “sauce” it’s extra important to use a gf pasta that you like the taste of since it will not be masked by heavy flavors. In a small saucepan, bring a cup of water to boil. Add the garlic and boil for just 1 minute to take out some of the sharpness. Remove, let cool and chop. In a large skillet, heat 1 tablespoon of the oil. Add the onion and a pinch of salt. Sautee over low-medium heat until translucent. Add another tablespoon of olive oil then the garlic and greens. Stir occasionally until the greens are coated. While the greens are cooking, put the pasta on to cook. When the greens are wilted, add a pinch of chili flakes and salt and pepper to taste. Strain the pasta and reserve some of the starchy pasta water. Toss the pasta with the greens and add more olive and 1 tablespoon at a time of the reserved water to create a creamy consistency. Add some of the pecorino and the rest should be added to each individual bowl. If you have access to goat or sheep ricotta, add a scoop to the pasta for an extra rich flavor. This past spring I was on a meatball mission. Since they so frequently have breadcrumbs I rarely get to them out at restaurants. I made a dozen variations and finally settled on this as the all-around favorite inspired by Jerusalemjerusalem. These have a Middle Eastern flair with the herbs and lemon and can be served with rice, vegetables, or just in the juices in which they are cooked. These are amazingly simple and naturally gluten and dairy free. In a large bowl, combine the meats, 3 of the green onions, garlic, egg, mint and cilantro, cumin, 1/2 teaspoon of the salt and a hefty couple of turns of the pepper mill. Mix well with your hands. Form the mixture into 2-inch in diameter meatballs (roughly the size of a golf ball). In a large skillet (with a lid), heat 1 Tablespoon of the olive oil over medium heat. When the oil is hot, add as many of the meatballs as will fit comfortably without touching. Sear for about 2 minutes on 2 sides. Remove the meatballs and set aside. Do this in as many batches as it takes to sear all the meatballs, remembering to add a tablespoon of oil before each batch. In the same skillet, heat 1 Tablespoon of the olive oil and scrape up all of the brown bits from the meatballs, leaving them in the pan. Add the remaining 2 green onions, broth, wine, bay leaves, 1 Tablespoon of lemon juice and bring to a boil. Keep the liquid at a low boil for 4-5 minutes. To the skillet, add the meatballs, another tablespoon of lemon juice, and a pinch of salt and pepper. The liquid should cover about 1/4-1/2 of the meatballs. Cover and simmer gently for about 8-10 minutes. Turn the meatballs and spoon the juices over them and partially cover for another 5-8 minutes. The liquid should get a little thicker but not dry- make sure there is always enough liquid to spoon over the meatballs. If it starts to dry, add another 1-2 Tablespoons of broth or water. Let the meatballs sit in the broth until ready to serve. Sprinkle additional herbs and lemon zest for garnish. Taste for salt and pepper if needed. Warning! 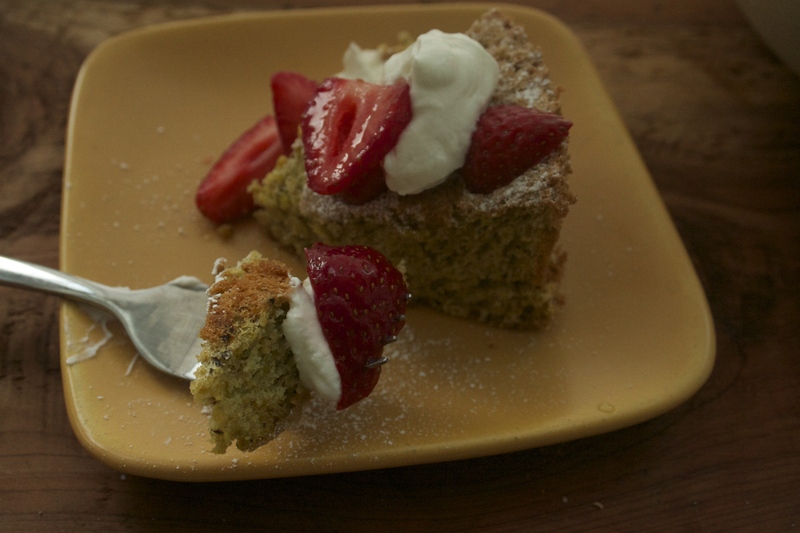 The following entry has a gluten and dairy-full recipe. There is a GF and DF version at the bottom. My friends Jake and Joy got married a few weeks back and asked me to make the desserts for the party. The groom is gluten free so I knew the cake would be too and I knew it would come from Flavor Flours (I made a four-layer chocolate cake with milk chocolate and whipped cream frosting, but that’s a story for another day). The desserts for the masses, though, that took some thinking. Jake and Joy wanted to be surprised so I perused my cookbooks and bounced ideas off of friends. And then it hit me. Back when ATE Cafe existed in Austin, my sister used to make a bread pudding usually with their leftover chocolate croissants. After Joy tasted it years ago, I recall conversations like, “Oh you’re going to the cafe, maybe I can get some bread pudding”, “I think I need your sister to cater so I can get some of that bread pudding” and so on. Of course this is what I would make for Joy’s party! I called my sister and asked for the recipe. I had never made bread pudding so I was FULL of questions (hence the very detailed instructions below). My sister texted me her custard recipe and slowly but surely answered all of my questions as they came up: Do I need to let it sit? Can I freeze it? Do I toast the bread? And so much more. I experimented with a batch a month in advance, froze it, and brought it to gluten-eating friends’ brunch to taste. Because I couldn’t try it, I brought along a list of questions for them to answer so I could adjust as needed for the occasion. When it was time to actually make the real version, I had a hive breakout and stayed in isolation for days. Instead of making the pudding ahead of time (half the reason I chose bread pudding! ), I was stuck at home starting to panic. Finally, Sunday night I covered myself up and prayed I wouldn’t run into anyone I knew at the grocery store. I piled my cart full of bread and cream (the two ingredients I would NEVER touch) and stumbled into line. And then I felt some customer get way too close to me. It was Joy. So much for a surprise! I mumbled something about making food for work and she sort of bought it. For a while. I made two full-sized restaurant pans of bread pudding, one with chocolate and one without. In the middle of the week I freaked out that that wouldn’t be enough for 100 people so I made a gluten free version too. Breakfast leftovers were really tasty. The following recipes have minimal ingredients, can be made ahead, and are very forgiving- perfect for baking for the masses! To prepare the bread, remove the bottom crust only (a very thin slice will do) and throw away. Cut or tear the bread into non-uniform bite-sized chunks. Place in a large bowl and set aside. Combine all other ingredients (except chocolate) in a separate bowl and stir until the sugar is dissolved. Pour 3/4 of the liquid over the bread and mix with your hands, massaging the liquid into the bread for a minute or two. Place mixture into a 9×12 baking dish and then pour the remaining 1/4 of liquid over the top. It will be mounded in the dish and most of the liquid will be absorbed. If using the chocolate, melt in a small saucepan, stirring constantly. Instead of pouring all of the pudding in the baking dish, pour half in, drizzle the chocolate over the top, and then pour the remaining bread pudding on top of the chocolate (if you put the chocolate on last, it will likely burn while baking). From here I covered it in plastic wrap and stuck it in the freezer until I was ready to bake it off. You can freeze unbaked for up to three weeks. When ready to bake, preheat the oven to 350 and place uncovered frozen bread pudding directly in the oven. Bake for 30-40 minutes, cover with foil and bake for another 18-22 minutes. The pudding should be hot all the way through and some of the top pieces will be crisp and browned. Baking time will vary depending on how large the loaves of bread are. Using a skewer, take a small piece from the center to ensure doneness. If you are not freezing it, place directly in the oven at 350 and bake for 20-25 minutes then cover and bake for another 15 minutes. *Choose a French or Italian rustic white bread loaf. I chose La Brea Organic French Loaf. You want to find a bread that is firm, unflavored, and not too crusty. The bread does not need to be stale. Use the day you buy it or within five days. In a small saucepan, combine the cream, milk, sugar and salt. Stir over low-medium heat. In a small bowl, whisk 2 Tablespoons whiskey with the cornstarch, breaking up any lumps. Add the whiskey mixture into the saucepan. Bring mixture to a low boil and reduce the heat to a simmer for 5 minutes, stirring occasionally. Remove from heat and stir in the butter and an additional tablespoon of whiskey. If you like your whiskey a little stronger, add another tablespoon. Serve right away or let cool, cover, and chill for up to 3 days. Serve warm or at room temperature. Follow all instructions for bread pudding above, except replace heavy cream with half coconut milk and half coconut cream. Use a crusty white bread like Udi’s. If using Udi’s, lightly toast all slices of bread in the oven (both sides) to dry it out. Be sure to massage the liquid into the bread pieces. Because I couldn’t eat the sauce, I also made one version where I poured 2 Tablespoons of whiskey directly on top before baking. That was delicious too.